We welcome new members to this community of faith. New members may register by contacting the Parish office during regular business hours, Monday through Friday, 8:30 am until 4:00 pm or by clicking here. Please come and make our acquaintance! Over 50 years have passed since Father Edwin Aufderheide was appointed to establish a parish in Vandalia, Ohio. Taken from three former parishes, St. Christopher's was canonically established as a parish on November 8, 1957. The first masses under St. Christopher Catholic Church were held in the Morton Middle School Field House and Fred Krim's Theatre before a permanent church was built. 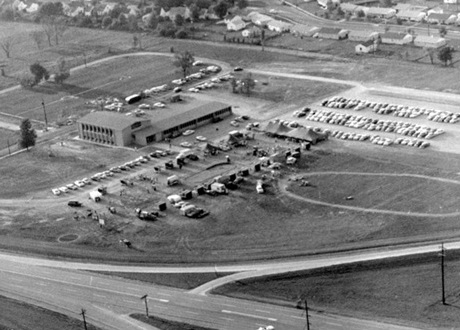 Ground was broken in June of 1958 for a combination church/school facility. The final cornerstone was set December 14 and school officially opened in September 1959. The church was housed in what was to be an auditorium/gymnasium for the school. The new parish served 250 families that first year and has now grown to over approximately 1400 families. A convent and rectory were built soon after. The convent now houses the St. Christopher Center for Children, a pre-school and day care educational program. A recreational facility was added and named Aufderheide Hall. It operates for a variety of parish, community and private activities. In 1989, a campaign to expand the school structure and build a new church was undertaken. The expansion of the school was completed prior to the 1994-95 school year. The new church was dedicated on April 28, 1994. In 1998 a campaign called Make Room for Tomorrow was initiated to raise funds for a new Religious Education Center. The newly named Emmaus Center was designed to serve the growth of the parish's school, Youth Ministry, and Religious Education Program.